There is no leather couch involved, and I don't sit behind you taking notes. Unlike the usual cartoon image of a therapy session, we sit facing each other and talk through the issues concerning you. 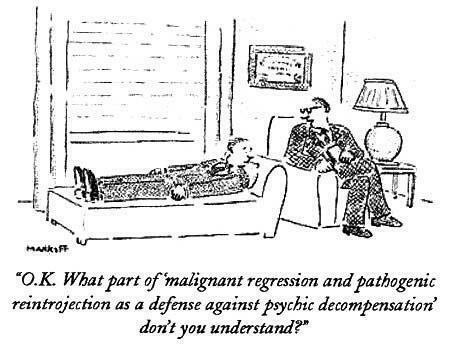 I was trained in a discipline (TA, Transactional Analysis) that avoids using complicated jargon and 'psycho-babble.' Rather than Latin or a secret kind of trade-speak, we communicate as equals using plain English. I am happy to explain my thoughts on any questions on theory, and there is plenty of material available on TA should you wish to find out more for yourself. You are also quite welcome to see any notes I make after our meetings. It is normal for the largest benefit (about 40%, citations available) to come from your processing of thoughts and emotions between sessions, continuing the process on your own. It is usual for us to meet once a week, although twice a week is possible if you feel it is essential. It is important to keep up regular meetings to maintain momentum - just like keeping to the full course of medication, rather than stopping when you start to feel better and allowing the problem to come back, stronger than before. Have you heard the one about how many therapists it takes to change a light bulb? Only one, but the light bulb has to want to change! If you are actively seeking to alter something in your life, or want to gain a greater understanding about an issue then talking confidentially with a strange may well be of great help. There is no magic wand to wave, no secrets to tell that will change your life overnight. If you are willing to explore, at a pace that is comfortable for you whatever is troubling you then it is likely that you will find pressures lifting, choices becoming clearer - perhaps even quite rapidly (and it can even happen in a single session.) At times you may feel like you are going backwards when hurt and pain that has been suppressed bubbles up but rather like having a painful tooth extracted, or a dislocated joint reset, the end result is usually preferable to living with the discomfort and side effects. Fortunately society as a whole is becoming more aware of the reality of stress, depression, anxiety and other psychological afflictions in our lives. Whilst in the past the preferred option was to grin and bear troubles in solitude and with a stiff upper lip - 'mustn't grumble, worse things happen at sea' - we are more likely now to realise that talking to a therapist is like consulting a physiotherapist, chiropractor, optician or chiropodist. There are times in our lives when we can all benefit from the skills and experience of a specialist whether it be for help with a bruised finger, or a bruised heart. There is no shame in taking care of ourselves - especially when others rely on us.